Matching Dragoons: Jonah Hex #92 "A Blaze of Glory!" Jonah Hex #92 "A Blaze of Glory!" Michael Fleisher, story - Gray Morrow, art - Conan and Klaus Janson, cover. Jonah Hex finds himself atop a hill in the pouring rain, looking down on a farmhouse. He decides that he might be able to find shelter in the barn and heads on out. In the barn are a couple of things. 1) A young girl asleep in the hay and 2) six men planning on dividing up half a million dollars in stolen loot (or $106.25 million today!). Well, when there is money and guns, guns usually come into play. Five of the men decide that they can kill the other one (the banker) and have more loot. So they do just that. The gunshots awaken the young girl (Cindy) and also alert Jonah that something is up. The girl tries to sneak out but the mean hear her and try to catch her. She hits one with a branding iron and bolts for the door. Outside she runs into a hay field and ends up finding Jonah Hex, hiding there himself. The men walk into the hayfield and Jonah guts one of them before he and; the girl sneak off to his horse. As they ride off on Jonah's horse, the remaining four men shoot at them. Emmy Lou is finding that the rainstorm is starting to flood the hole she is in and it has made the sides too slippery to climb out. She starts hollering for help and an old man in a nearby cabin hears her over the rain. He grabs his rifle and; dog and he sets out to find out what is going on. Brett who is also nearby hears Emmy's cries as well and starts searching harder. The old man arrives at the hole first, tosses down a rope and hauls her out, taking her back to his cabin. However, Brett has seen all of this and now knows where Emmy is. Meanwhile, Jonah and the young girl are still riding. She asks where they are going and Jonah says that she will stay with some ranchers he knows until he can catch the bank robbers and then get her back to her family. She states that she is an orphan. Despite the fact that she wants to help Jonah locate and identify the killers, Jonah drops her off at the ranch house. Jonah rides off into the night to locate the killers. 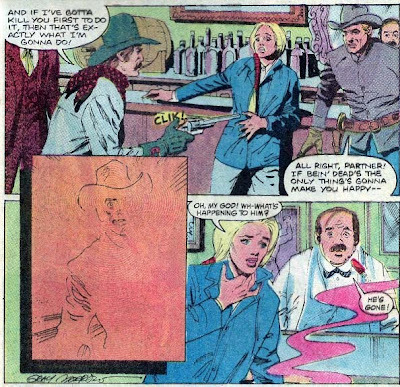 Up in her room a few minutes later, Cindy decides to climb out the window, steal a horse and take out after Jonah Hex. Of course, while she is out looking for Hex, the four killers, who are searching for her and Jonah, happen to see her ride past in the distance and take off after her. Back at the old man's cabin, Emmy is drying out by the fire when there is a knock at the door. Emmy tries to stop the old man from answering it, but Brett busts in and cranks the old man upside the head. The man's dog leaps into the fray and takes a hunk out of Brett's arm, giving Emmy the chance to get out the door and into the darkness. Jonah finally locates some tracks of the four killers just as Cindy shows up. Jonah is about to read her the riot act when he suddenly realizes they are in the crosshairs. Jonah knocks Cindy to the ground just in time to avoid getting shot and he hustles her behind some rocks for protection. Jonah runs out to his horse to grab his rifle, but he is unable to get a shot at the killers. Jonah asks Cindy if she has ever fired a rifle and she says that her daddy taught her. Jonah interrupts her and she says that he taught her before he died. Jonah tells her to fire a shot every ten seconds and he heads out to get the drop on the killers. Meanwhile the killers have their own ideas, sending one of their guys to be on the lookout in case Hex decides to ambush them. Eventually Jonah does sneak up behind the killers and as he lights a stick of dynamite, one of the gunmen steps out of the shadows and is about to shoot Hex. Suddenly the thug falls, dead from Cindy' rifle shot. Jonah then tosses the dynamite and finishes off the remaining three. The next morning Jonah and Cindy are in town, turning the remains in to the sheriff and collecting the bounty. Cindy is excited that she'll be able to ride with Hex but just then a man and woman run up and start hugging Cindy, saying that she was a runaway. Cindy's dad starts to give Hex a reward for finding their daughter, but Jonah shrugs him off, still counting his reward from bringing in the killers. Jonah wanders down the street, ignoring the cries of Cindy, and heads into a saloon. He orders a drink and is standing at the bar when Emmy Lou suddenly runs in. Emmy breathlessly tells Jonah that someone is after her and then Brett crashes into the saloon, telling Jonah to step aside. Jonah calmly tells Brett to put the gun away but it looks like there will be a shootout when that strange ray appears and Jonah Hex vanishes in front of everyone. All in all, a sad end to Volume one of Jonah Hex. Jonah acts out of character turning down the money, one minute he appears to be happy about having Cindy around and the next he ignores her. I always wished that this book could have made it to issue 100, but on a bimonthly schedule, 8 more issues would be over another year of very poor sales. But...but do we ever find out what happened to Emmy? A really lame send off. Strange Art, (Gray Morrow's interpretation of JH reminds me of 70's era JC Penneys catalogs or Public Health comics warning teens about STDs) strange plot lines (JH wants a cute child sidekick? Huh?) and finally, the anti climactic disappearance into a panel of orange. Jonah was (and still is) the only comic book I ever collected. I stewed about this issue for years. 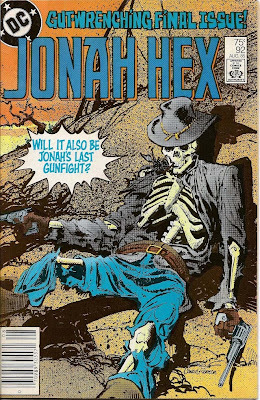 Sadly, Jonah Hex was always a better idea for a comic book than it is in it's execution. I was so disappointed in this one. The art does look like something from the 60's or 70's. Everything was way too stiff and the ziptone shading just made everything so damn dark & murky. Also, we never get any sort of resolution for Adrian, Emmy and we had to wait almost 30 years to hear even a mention of Mei Ling again. That said, yeah, kind of a sad send-off. I've liked Morrow's art elsewhere, but it's not clicking here. And best guess...I think Fleisher was writing Warlord about then as well, and those, eh, weren't great, but may have had their moments.